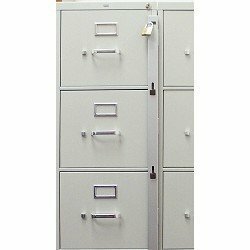 File Cabinet locks are an excellent way to secure your file cabinet contents and comply with HIPAA regulations. The simple to use, easy to install bar securely fastens to the side of any file cabinet (1/2" of space needed next to drawers). Bar has a closed end for added security and a convenient knob for easy and smooth operation. This file cabinet lock can provide a second layer of security to those units with built-in locks or, if your keys are lost, these bars can provide an easy lock replacement system without having to replace the entire cabinet. THIS ITEM REQUIRES THE USE OF A PADLOCK. A padlock is not included, but we recommend the use of an ABUS 55/40 padlock, which is available as keyed-alike and keyed-different. If using your own, make sure it is a 40mm padlock and has a 1/4" shackle diameter. Constructed of heavy 16-gauge formed steel, CABINET NOT INCLUDED. For use with a 3-drawer file cabinet, PADLOCK NOT INCLUDED.